A year after First Spit, Broken Down releases its second spit The Other Shore as CD, Digipack and digital download. 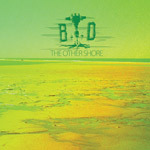 Industrial Metal / Industrial Rock one-man-band Broken Down releases today its second album The Other Shore. - Everything is everywhere, even though there is still a designated and clearly audible formula. It’s the kind of record that obviously will not be for every listener, but it’s worth checking out if you’re up to the musical challenge. As I said, I hear some Solefald influence here, so I feel that fans of that legendary experimental act will want to give this one a listen as well. A month ago Broken Down released the free downloadable single / maxi EP Another Shore which notably includes remixes by S.H.I.Z.U.K.A (FR) and by Kiss is Kill (US). Broken Down put online the stems (separated channel / multitrack sources) of its songs to let you build your own remixes as an answer to these original tracks. Feel free to send your song to brokendown [ @ ] altsphere [dot ] com.